Mr. Kern 83 passed away suddenly at his residence on Thursday August 24, 2017. He was born in Reese on July 13, 1934 to the late Peter & Lena (Mandell) Kern. Mike married the former Mary Ebenhoeh on August 25, 1956 at sacred Heart Catholic Church, Saginaw. She survives him. 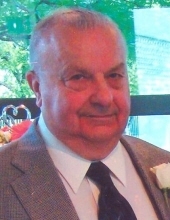 He was a veteran of the Korean War serving in the U. S. Army and worked at Presto-Lite for 29 years and 10 years at Greve Foundry in Reese.… Mike enjoyed fishing, puzzles, automobiles either collecting, caring for them or buying a new one but his greatest joy was his great grandchildren. He is survived by his wife of 61 years and their children Carol Wajer, James Kern, Dennis Kern, Duane Kern and Thomas & Debra Kern; a daughter in law Karo Kern; 11 grandchildren and 11 great grand children; sisters Barbara Cook and Dorothy Spiekermann and a sister in law Dolores Kern. He was preceded in death by a son Michael David Kern and eight brothers and sisters. Funeral Liturgy will take place 11:00 am Friday, November 17, 2017. at Holy Spirit Parish, 1035 North River Road. Reverend Peter J Gaspeny will officiate. Inurnment will follow in Roselawn Cemetery. Arrangements are entrusted to Rivertown Funeral Chapel.